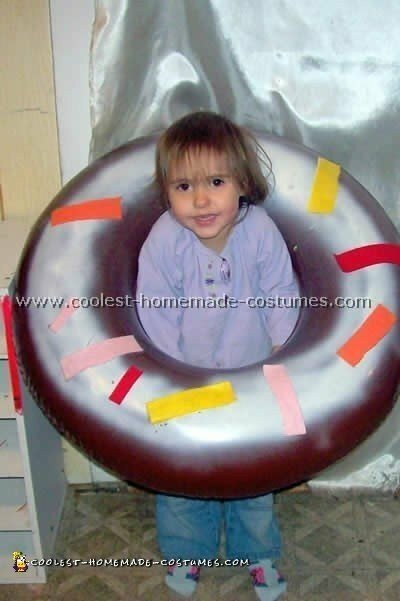 For this cute yet delicious costume my daughter age two and a half wanted to be a "Loclate o-Nut" ( Her pronunciation). It took me a week to decide what to use because I was only interested in easy costumes. Hula Hoop came to mind then I thought a float swim tube. The items you will need for this are one swim tube 30′ or smaller, (I used 30"), one can of any color spray paint, one can of white spray paint, one can of brown spray paint and four pieces of felt. Take your tube, inflate and paint the whole thing brown. Let dry overnight. Spray paint a white area on the top to look like frosting. Then cut any size sprinkles out of the colors of felt you choose. I was going to glue but the spray paint I chose ended up being "tacky" so it stuck just fine. Glue or stick them on cardboard out in a circle the size of the top of the laundry basket then cut a hole for the head. Let dry and you are all done. I got so many compliments. Hope this helps others that are looking for easy costumes! My husband and I spent over a month going back and forth trying to find easy costumes for Halloween. We wanted our costume to be something we dressed up as together, something that didn’t cost a lot of money and something very original. 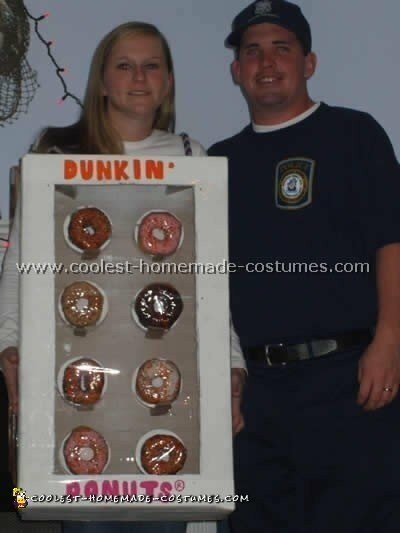 Somehow we came up with the idea of being "A Cop and His Box of Donuts" – Dunkin Donuts to be exact! Originally we thought we’d make him a fat cop but the pillows stuffed in his oversized pants just didn’t look right. He ended up being his normal size. We found him a police t-shirt and some navy uniform-looking slacks at our local Goodwill. We bought handcuffs at the $1 store. He wore his dad’s old army boots and we used a Harley-Davidson police-inspired cap. I made the box of donuts out of two slender cardboard boxes. The back box was spray painted orange. The front box was spray painted white and we cut a hole out of it to make a window. I painted the words "Dunkin Donuts" on the front of the box and then bought a dozen donuts from Dunkin Donuts. We only used eight so we had a few to eat. 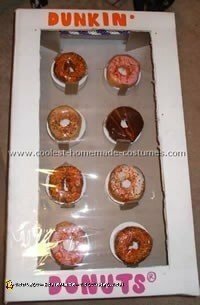 I wrapped each of the Halloween-decorated donuts in saran wrap and hot glued them to a piece of sturdy cardboard. I then mounted them on an empty spool of craft ribbon to make them sit up taller in the box. I hot glued everything together and hot glued the donut on its stand to the inside of the box. After placing all the donuts in the box I had to give them a little support because of gravity but they stayed in place the whole night! I then covered the window with clear packing tape to create the window effect. We cut holes in the top of each box and attached them together with sturdy nylon rope. The ropes created shoulder "straps" that went over my shoulders. I put the boxes over my head and just stepped in between the boxes! These were two easy costumes and were a big hit. Unfortunately there were a few people that didn’t realize how we went together but once it was explained everyone just laughed! This is an easy costume to make but a little bit time consuming. You will need: munchkin box from Dunkin Donuts, cardboard box for costume, Styrofoam balls about 20-25 (about 4 inches in diameter), orange, pink, white and brown, poster paint, red glitter, glue craft glue, hot glue gun, wooden barbeque skewers, small colored beads (rainbow orange brown), Velcro (heavy duty!) shoulder straps for the box and white tissue paper. 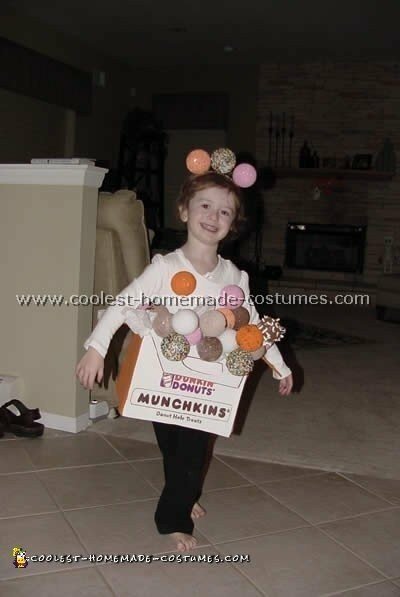 I got a munchkin box from Dunkin Donuts to use as a model. I obtained a regular cardboard box that was rectangular in shape and big enough for my child to step into. I cut the top flaps to mimic the munchkin box from Dunkin Donuts. I painted the box to match the colors using poster paint. I copied the logos from an actual munchkin box and enlarged it. I then traced it onto the cardboard box using carbon paper and painted it too. I used Sharpie markers to help with the fine details and outlining of the costume. For the munchkins I painted Styrofoam balls (approximately 4 inches in diameter) with craft glue and rolled some in colored beads. I did a few with rainbow colors and a few with orange and brown beads so they look like sprinkle covered. I put them on skewers and placed in a vase to dry. I then painted other Styrofoam balls, some pink, some tan with glitter glue at one end for jelly, some dark brown with small white strips of paper glued on (for coconut) and some plain white. I took a white shirt and Velcro’d the bottom 1/3 to the inside of the box. I also hot glued white tissue paper to the inside of the box rim so it looked like the paper they put in the munchkin box at the store. I hot glued the munchkins on the shirt and all over the rim/inside edges of the box so they look like the munchkins were overflowing. If I were to do it again I think that I would put white straps on the box rather than use the shirt to hold it up. As a final touch I hot glued three munchkins to a wide head band and used a big barrette to anchor it to my child’s head. I loved this easy costume; it was perfect in every way and would probably make one for myself. As a couple’s costume your partner could go as a cup of coffee!